He was born at Kronach in upper Franconia, probably in 1472. His exact date of birth is unknown. He learned the art of drawing from his father Hans Maler (his surname meaning “painter” and denoting his profession, not his ancestry, after the manner of the time and class). His mother, with surname Hübner, died in 1491. Later, the name of his birthplace was used for his surname, another custom of the times. How Cranach was trained is not known, but it was probably with local south German masters, as with his contemporary Matthias Grünewald, who worked at Bamberg and Aschaffenburg (Bamberg is the capital of the diocese in which Kronach lies). There are also suggestions that Cranach spent some time in Vienna around 1500. According to Gunderam (the tutor of Cranach’s children) Cranach demonstrated his talents as a painter before the close of the 15th century. 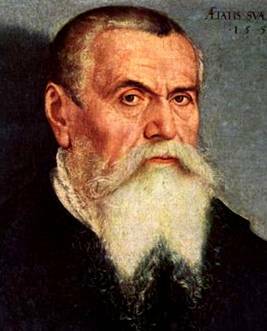 His work then drew the attention of Duke Friedrich III, Elector of Saxony, known as Frederick the Wise, who attached Cranach to his court in 1504. The records of Wittenberg confirm Gunderam’s statement to this extent that Cranach’s name appears for the first time in the public accounts on the 24 June 1504, when he drew 50 gulden for the salary of half a year, as pictor ducalis (“the duke’s painter”). Cranach was to remain in the service of the Elector and his successors for the rest of his life, although he was able to undertake other work.